I am the worst guitarist in North America. I am also a solid andever-improving high school English teacher. The two are related.Although some college educational programs appear loston the point, a good teacher must be skilled in the subject heor she is teaching. This is essential for the student -- but for theteacher, it creates a life that is conflicted, if not paradoxical. You must be very good at what you teach, therefore, you spend your life withpeople who often aren't nearly as good -- or as interested in -- the subject you love. If I were put in charge of a college of education, I would attach asimple requirement to the foundation methods class: All studentswould be required to take a class in something they aren't good at,preferably something at which they stink. Think about it: Many of the most skilled professional athletesmake the worst coaches. Magic Johnson, for instance, was a ratherinfamous failure as a coach -- he couldn't relate to the lackadaisical attitudeand poor execution of his charges. Many educators experience thesame thing: "Why won't they simply do their work?" "I've explainedthis fifty times!" "What's wrong with these kids?" are familiar teachers'lounge refrains. I have said the same things about my students; I've even saidworse. But once a week, the shoe is on the other foot -- which is firmlyplanted on the wah-wah pedal. I always imagine Mike, my guitarteacher, somewhere in the middle of his 11:30 A.M. Saturday lesson,looking down at his watch and realizing there is nothing he can doto escape his noon lesson. The incompetence! The drudgery! TheEnglish teacher with the fumbling hands! Mike is the best guitar teacher I've ever had. My first guitar teacher was the opposite of me: a wonderful guitaristand a poor teacher. "Do this," he'd say. His fingers would blur up anddown the fret board. I'd stare at him. He'd stare back. "You want me toplay it again?" Sure, I'd say. Another blur. I lasted about six lessons,then, deeply embarrassed, quit playing for ten years. My second guitar teacher was a fair instructor, but burned out anda little sad. 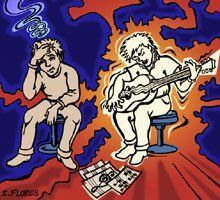 He'd spend half the lesson talking about the guitar heplanned to purchase, or the studio he wanted to set up in his basement.It was a little hard to blame him; I was quite a challenge. Mike is the third bear in my Goldilocks guitar-teacher equation. Inhis guitar studio, a faded 1986 Stevie Ray Vaughan concert poster looksup at his secondary education diploma from Roosevelt University. Heknows what he's teaching, and he knows how to teach. He breaks thingsdown. He takes Eagles songs (the ones with the easier chords) and playsthem at "therapy" tempo, or what a high school counselor might call"skills" tempo -- really, really slowly. I do have just a smidgen of talent. After two years of lessons, I cansometimes hear a note in a song and reproduce it on my guitar -- asimple thing, but for the pitch-challenged such as myself, a revelation.I can play a few serious numbers and sing them at the sametime -- "Old Smokey" and "Lyin' Eyes" for instance. This is a wonderto me. Sometimes, I give up television for a week, hide out after myson goes to sleep, and actually practice what I was supposed topractice. I show up on Saturday ready to rock, and my guitarteacher doesn't even ask if I'm ready to play what we went over lastweek. No doubt he fails to do this because the chances of me havingactually practiced my assignment are one in five. Nonetheless,I feel a bit like screaming. It is in these moments that I gain a new understanding of whatit's like to read Julius Caesar when you have no clue what is goingon. I have actually looked out into the classroom and recognized thescrunched-up, frustrated look on my students' faces preciselybecause I've felt the same look come overmy face as I mangle a Richard Thompsonguitar lick. They say failure is the best teacher, but Iknow better. The best teachers are the oneswho have struggled and succeeded. Mitch Martin is a high school English teacherwho lives in Naperville, Illinois. He is also ajournalist whose articles have appeared inNaperville Magazine, the Chicago Tribune, andthe New York Times.